"This chilled roasted eggplant and bell pepper salad is a great side dish or an appetizer in the summer. Perfect for parties; just add a bowl of tortilla chips next to it. You can also serve this hot with grilled chicken or fish. Either way, it's delicious! Garnish with dill or parsley." Heat 1 tablespoon oil in a large skillet over medium-high heat. Add onion and saute until browned, 5 to 7 minutes. Transfer to a plate. Add remaining olive oil to the skillet; add eggplant and bell pepper. Saute until starting to soften, about 5 minutes. Add tomato, garlic, parsley, salt, and pepper; cook 2 to 3 minutes more. Return sauteed onion to the skillet. Adjust seasonings if necessary. Transfer eggplant mixture to a baking pan. Bake in the preheated oven for 30 minutes. Cool before serving, about 1 hour. 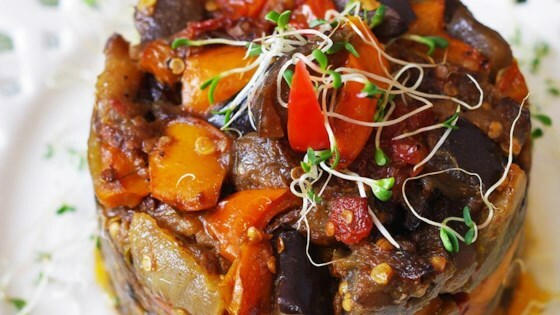 Enjoy exotic northern African flavors in this grilled eggplant and pepper salad. You can substitute cilantro for parsley, if you like. You can make this salad a day ahead, since the flavor is even better the next day. Excellent eggplant dish! Good hot or cold. I used multi colored peppers and a can of diced tomatoes rather than fresh. I also added a can of drained chickpeas, oregano and basil. I love the vegetables in this recipe and it’s pretty simple to make but the end result is watery and not crispy. I’m sure it’s something I may have done wrong but I won’t make this recipe again. I made it quickly in one pan and it was delicious! Add a zucchini and bay leaf and it’s ratatouille!